Figure 6-16. - Shop load plan (standing job orders). man-day targets are 30 percent for ESA, 40 percent for SJOs, and 30 percent for specific job orders. In the 2ndNCB camps, specific job orders include only maintenance and repair projects and exclude construction projects. 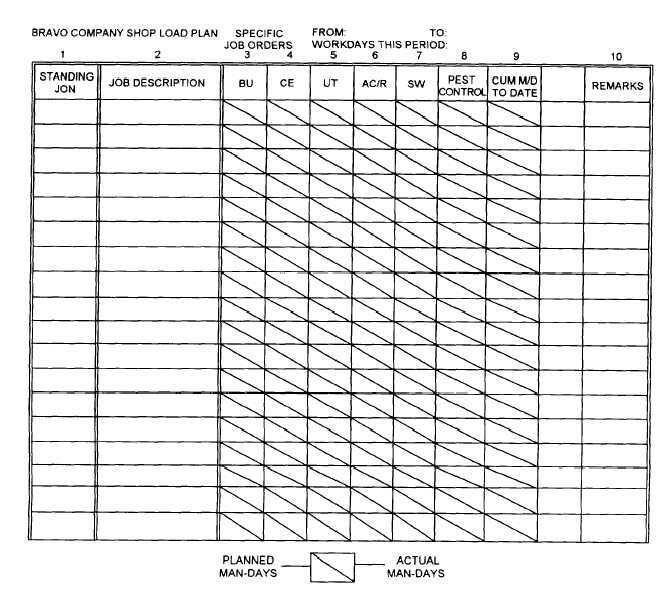 One copy of each marked-up form is forwarded to the 2ndNCB/3rdNCB DET and the other copy is retained by the maintenance chief. Since maintenance is an ongoing process, all records for specific jobs, standing jobs, and service calls are retained in the facility/equipment history jacket. This allows for a continuous history to be passed on to each relieving battalion. Suggestions for improvements or changes should be sent to the 2ndNCB/3rdNCB DET for action.